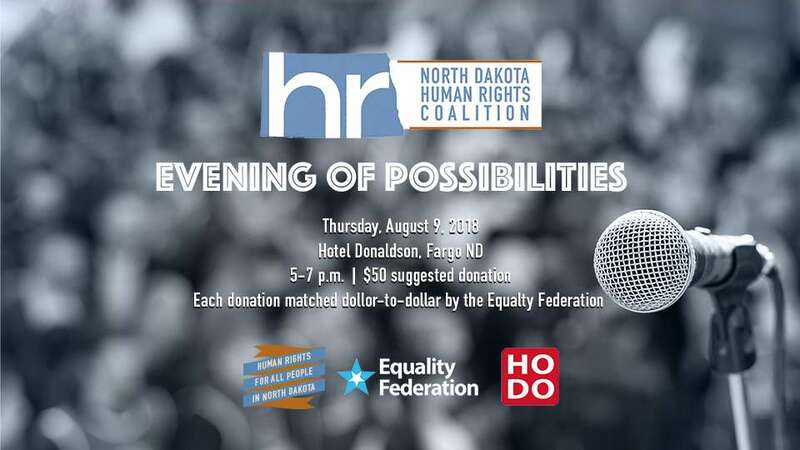 Join the North Dakota Human Rights Coalition on Thursday. August 9 from 5 to 7 p.m. at the Hotel Donaldson for an Evening of Possibilities. We’ll be raising funds as part of our matching grant with the Equality Federation. Every dollar raised at the event will be matched dollar-to-dollar, so your donation of $60 becomes $100, $250 becomes $500, and $500 becomes $1,000. Our goal is to raise $5,000. And there’s a movement taking place. There are currently more women, more Native Americans and more Immigrants running for local, state and federal office than ever before. A moment is taking place, and we’ll have a number of these courageous individuals joining us to share their motivations, their aspirations and what it means for the Nation moving forward. Get your tickets today via Network for Good.